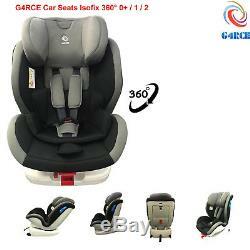 G4RCE BLACK/GREY ISOFIX Child Baby Car Seat For Age From Birth 0/1/ 2 Group UK. HS, PO, IV, FK, KW, PH, PA, AB, BT, KA, JE, GY AND IM. Austria, Belgium, Czeh Republic, Denmark, Estonia, France, Germany, Hungry, Italy, Latvia, Lithuania, Luxembourg, Netherland, Poland, Slovakia, Slovenia, Spain, Sweden, Switzerland, Finland, Romania and Croatia. 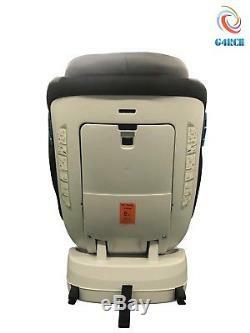 Isofix Car Seat offers you the luxury of both reward facing and forward facing in one car seat. 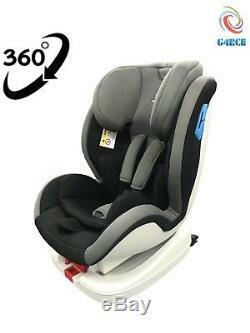 The 360° seat rotation allows you to smoothly change from one to the other without any fuss. It also makes for easy access to your child from the side and makes it much easier for seating them. Isofix fitting and 5 point, single hand adjust safety harness means your child is seated securely and safely for the journey. Safety car seat for Group 0 1 2 (From birth to 25kg). 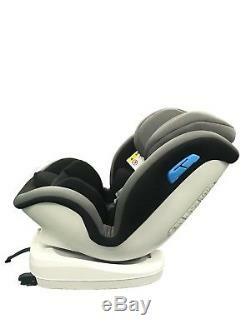 Rearward facing from birth to 18 kg allows you to keep your child rearward facing even longer. Offers you the choice of position that best fits you and your child. 5-point safety harness with one-pull adjustment distributes the impact forces out across the strong bones of the body and into the seat, plus it allows you to perfectly adjust the harness to your childs size and keep them secure in the seat no matter what collision you have 360° seat rotation makes it easy to move the seat between rearward and forward facing without re-installing and also place your child in and out from the side. ISOFIX system allows direct connection to the cars ISOFIX anchorage points for a simple and safe installation. Multiple recline positions allow a comfortable sleeping position for your child that you can adjust without disturbing them. Newborn insert provides extra comfort and support for your baby. Height-adjustable headrest and harness with easy single handed adjustment allows the seat to grow with your child without the need to remove and re-thread the harness. 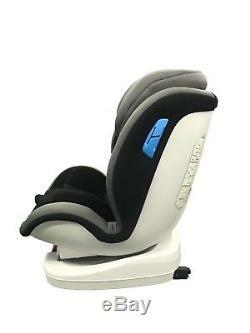 Deep, softly padded full side wings provide optimum Side Impact Protection for your child along the entire seat. Performance chest pads reduce your childs forward movement and energy that occurs in the event of an impact. Quick-remove washable cover eliminates the need to remove the harness when washing the cover, therefore ensuring the harness is always installed correctly. Belly pad for your childs comfort. Softly padded cover keeps your child comfortable in their seat. Choose rearward facing or forward facing for your child from 9 - 25kg, offers you the choice of position that best fits you and your child. Size - H62 x W44 x D46cms. When it comes to baby products, SAFETY is always our first concern. We have put the safety standard as our priority. This toy meet all EU standards EN71, 1, 2, 3 ECE R44/04. Give us a chance to sort things out for you. Our friendly and professional sales are always available to answer any questions that may arise. We pride ourselves on customer service and contact ability. Don't be fooled by some of the competition. Our prices are competitive, but our service is superior. Our items are checked and rechecked before despatch to ensure that it is the correct item. We post items very quickly usually the same day before 12pm. You will most probably receive a response the same day. Caller is a family run business. We are very flexible and friendly. We sell New and Graded products. 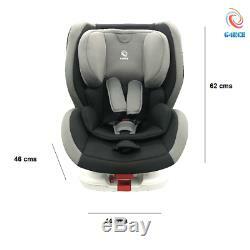 The item "G4RCE Car Seat Group 0+/1/ 2 360° Degree Rotating Recline Isofix Car Seat 0-25KG" is in sale since Tuesday, November 6, 2018.